Fast 12 Core 2.70Ghz - Intel E5 Xeon (E5-2697 V2) - 3.50Ghz Turbo AES HT VT 64/32 Bit. Dual Gigabit Ethernet. Airport Extreme Wifi. Cylinder Case. 6 Thunderbolt 2.0 Ports, 1 HDMI, 4 USB 3.0 Ports. 802.11ac & Bluetooth 4.0. Minor wear from normal use. Includes: PC/Mac Keyboard & Mouse. 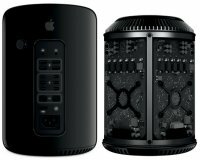 Mac Pro 6.1 is an ultra high end solution designed for complex computing environments that require outstanding performance, expandability and capacity. Professional workstation with high end Xeon Processors, built for Graphics, CAD/CAM, Gaming, and Industrial applications. Supports SATA, Intel VT, DDR3 Ram.Fresh installation of OSX 10.14 Mojave. Matching sets of memory used by Apple in Mac Pros. (Micron, Hynix, Samsung etc) Excellent and fully functional condition. Cosmetics are good, machines have light use. Some minor case wear, scratches, or dings, all cosmetic which do not effect performance. Dust free, non smoking units, all well checked by our Apple specialists. * Off short lease, used product, excellent functional condition. minor wear, including scratches from normal use.